This book examines key theorists in depth in order to give some insight into cultural change as reflected in their curricular recommendations and in the interplay they reveal between the two fundamental educational concepts of ‘artifice’ and ‘nature’. 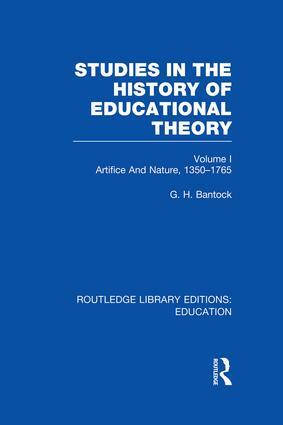 The essays on the various theorists – Erasmus, Vives, Castiglione, Elyot, Montaigne, Bacon, Comenius, Locke and Rousseau can be read separately but the book also forms an integrated whole, with a continuity of themes explored from theorist to theorist. The book not only charts a historical development but also reveals much that may deepen our understanding of contemporary educational dilemmas. Acknowledgements. Introduction. Part One The Humanists: ‘Words’ 1. ‘A Chattering Flock’: the Humanist Experience 2. ‘Fashioned not Born’: Erasmus 3. ‘A Graceful and Nonchalant Spontaneity’: Castiglione 4. ‘The Governor’: Sir Thomas Elyot 5. ‘A Knowledge of Nature’: Vives 6. ‘Que Sçais-je?’: Montaigne Part Two The Empirics: ‘Things’ 7. ‘Heaven Here’: the Coming of Science 8. ‘Knowledge is Power’: Francis Bacon 9. ‘Celestial Agriculture’: Comenius 10. ‘The Under-labourer’ in Courtly Clothes: Locke 11. The Disenchantment of the European Mind’: The Enlightenment 12. ‘The Mountain Goat, not the Ballet Dancer’: Rousseau. Conclusion. Short Biographies of the Main Theorists. Select Bibliography. Index.